The following is the text of a speech given by MHS Past President Harry Duckworth at the Tartan Day celebration at the Manitoba Legislative Building on 6 April 2012. Your Honours, Mr Chairman, honoured guests, ladies and gentlemen. I thank the Tartan Day committee for the opportunity to speak to you on the Selkirk or Red River Settlement, whose bicentenary we are commemorating this year. The history of the Scottish Highlands, in the years after the battle of Culloden, is dominated by a great emigration movement, one of the defining processes in the formation of the British Empire. For generations, the Highland Scots had been small farmers, growing barley and grazing cattle. Their lands were clan property, though the chiefs were in charge in peacetime and in war. But now a different relationship was developing between the clansmen and the chiefs. The violent old ways of the Middle Ages were no more, and would-be warriors were finding a new outlet for their temperaments in the British Army. Military leaders were no longer needed in the Scottish glens, so the chiefs could live in the towns of the south, where they found new activities, and greater comfort. Their sons mastered the pen instead of the claymore, and found employment as lawyers or merchants. To live in the towns, the chiefs needed a cash income, and they started to think of themselves as the owners of the clan lands. In Edinburgh or Aberdeen, they met southerners who had suggestions as to how the Highland valleys might yield more profit. The most popular idea was to replace the poor and inefficient tenant farmers with a hardy breed of sheep that could graze all over the hills, in all kinds of weather. Bringing this idea to the Highlands eventually led to the forced expulsion of many Highlanders from their ancestral lands—the Highland Clearances. There were those who saw the writing on the wall long before this, of course. Throughout the 1700s, large numbers of Scots left their homeland to settle in the New World. The Conquest of Canada, in 1759–60, opened up a vast new country for settlement by British subjects, and soon the Scots were flooding in. By the year 1800, most Highlanders would have had friends and relations who could inform them in person, or by letter, of opportunities that awaited them over the sea. In preparing themselves for emigration, the Scottish Highlanders had one great asset—education. In Scotland, even in the remotest districts, a good education was widely available. Many people could read and write, and many Gaelic speakers could also operate in English. Though the Highlanders might be living in poverty, they were not living in ignorance. One of the most imaginative promoters of Scottish emigration was Thomas Douglas, the fifth Earl of Selkirk. As a boy, he had seen the American privateer, John Paul Jones, come ashore and alarm the Selkirk mansion by the shores of the Solway Firth. This experience, he later believed, taught Selkirk to distrust Americans in general, and be suspicious of their motives and ambitions. Thomas Douglas and his brothers were caught up in the ideas of the Enlightenment, the new insights that engendered our modern understanding of human rights and social responsibilities. He travelled widely, and he learned and remembered. All six of his older brothers died before their father, and in 1799, Thomas Douglas succeeded to the title of Earl of Selkirk, and to a substantial fortune that would allow him to follow his dreams. 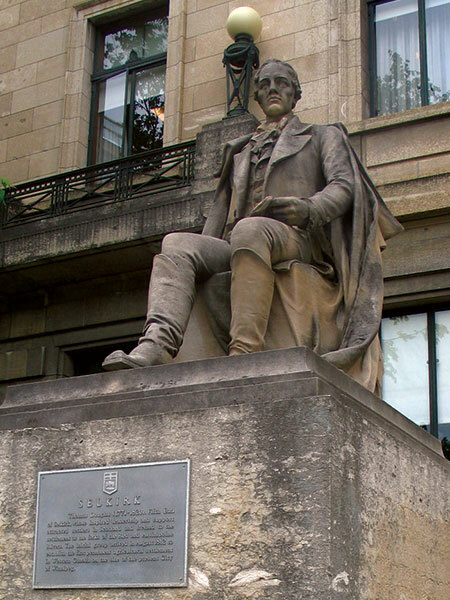 Thomas Douglas (1771–1820), Fifth Earl of Selkirk, guards the east entrance to the Manitoba Legislative Building. It is one of several commemorations of Selkirk and his settlers in Manitoba. Selkirk knew that the Highlands were no longer supporting their population, and that things would get only worse. For most, new homes would have to be found elsewhere. In 1803, using his own resources, he brought a group of Scottish colonists to Prince Edward Island. This project was a success. The next year, he took another group of Scots to Baldoon, in Upper Canada. The land there was poor for farming, and only a few settlers remained there for long. For his last and most ambitious venture, Selkirk turned his eyes much farther west, to the Red River of the North. As far as the British authorities were concerned, Red River was already the property of the Hudson’s Bay Company, whose title was based on the old grant of Rupert’s Land from King Charles II of England, in the year 1670. Selkirk bought shares in the Hudson’s Bay Company, to gain the influence he needed for his scheme. In the spring of 1811, for a price of 10 shillings, the Company sold him some 116,000 square miles, to be called Assiniboia. Here, an agricultural settlement was to be placed. Much of it was magnificent land. That summer, Lord Selkirk sent an advance party out from Scotland, by way of Hudson Bay, with orders to go to the Forks of the Red and the Assiniboine, and prepare for the arrival of the first real party of settlers, who would come the following year. The commander of the advance party was Miles Macdonell, who would have the title Governor of Assiniboia. The ships arrived very late in Hudson Bay, and the advance party could not get to Red River before the onset of winter. Instead, they remained in a winter camp near York Factory, proceeding south the next summer, after the rivers were open. The advance party did not get to Red River till the end of August. On 4 September 1812, at a site just north of the present St Boniface Hospital in Winnipeg, Macdonell assembled his men and a few local fur traders, and read out his credentials, declaring that he was taking possession of Assiniboia on behalf of Lord Selkirk. Meanwhile, the first group of actual settlers had reached York Factory on schedule, and by mid-October they were also at Red River. Very little had been done to prepare for their arrival, but Macdonell did his best. He sowed some winter wheat—this was the first wheat sowed in western Canada—and took the whole party south to Pembina for the winter. There, arrangements were made with the Métis buffalo hunting community to provide food. The winter was a shock for the settlers, who had never encountered such cold, but they got through it, and in the summer of 1813, they were back at the Forks, ploughing land, sowing crops, and putting up buildings. Selkirk sent a further group of settlers out from Scotland that year, and a third group in 1814. In the second winter, the settlement still could not provide for itself, and everyone moved back to Pembina again. It was only with the season of 1814 that the colony became reasonably self-sufficient, from a combination of its own crops and the produce of the hunt. The farm lots were long and narrow, each with a frontage on the Red River, and all on the west side. The southern boundary of the group was just south of the present Bannerman Avenue, and the tract ran north to the place where the old Kildonan stone church was later built, and then beyond to the present boundary of the City of Winnipeg. The lines of the streets in this part of Winnipeg, running slightly north of west, preserve the layout of the lots as they were surveyed by Peter Fidler, the Hudson’s Bay Company surveyor, in 1817, and as they remain to the present day. In this part of Winnipeg, some of the modern streets, such as Bannerman, Polson, and Matheson, preserve the names of settlers. Apart from the natural dangers, and the difficulties of an unfamiliar climate, the main challenge that the Selkirk Settlers had to face was from their fellow Scots. Assiniboia was far from uninhabited in 1812. There was a large population of First Nations people—Assiniboines, Crees and Ojibwes. There were a couple of hundred so-called “freemen,” retired fur trade voyageurs or clerks, all with native wives. Greatest in terms of their influence, though few in number, were the actual fur traders. There were a few Hudson’s Bay Company posts hereabouts, but the strong presence was that of the North West Company, a mighty and imperious enterprise controlled by Scots. The Nor’westers’ main interest in the Red River district was not in furs, but in pemmican, the fuel on which the canoe brigades ran. Much of the pemmican came from what Miles Macdonell was now calling Assiniboia, and a confrontation was inevitable when Macdonell, worried about how he was going to continue to feed his colonists, proclaimed that no foodstuffs were to be exported from Assiniboia. The North West Company, already suspicious of Lord Selkirk’s motives, saw this “Pemmican Proclamation” as a direct attack on their business enterprise. This was in 1814. At once, the North West Company set to work to undermine the colony. First, they told the colonists that Indians were coming to destroy them. This was seen to be false, and one particular First Nations leader, the chief Peguis, showed himself as the settlers’ friend. The North West Company then warned that the Métis, mixed-blood children of fur trade fathers and native wives, were going to attack the colony. This was more believable—many Métis were employed by the Nor’westers, or had family ties to them. A campaign of harassment began, and the Nor’westers accompanied this with an offer to transport the settlers to Upper Canada, where new lands would be found for them to settle on. By midsummer of 1815, about two-thirds of the colonists had accepted this offer, while a pretext was found to make a prisoner of Governor Macdonell. Something like 110 individuals were taken down to Canada. Those colonists who did not defect left their farms for the safety of Jack River, at the north end of Lake Winnipeg; and the Nor’westers burned their buildings behind them. So it seemed, near the end of the summer of 1815, that Lord Selkirk’s experiment had failed, and that the colony had indeed been destroyed. Then, at Jack River where the remnants had retreated, a Hudson’s Bay Company trader, Colin Robertson, persuaded the settlers to return to Red River. Strengthening their resolve, a further party of new settlers, fresh from Scotland, now made their appearance. Most of these had been displaced from their homes in Kildonan by the most notorious of the Highland Clearances, that inflicted by the Countess of Sutherland, and all they wanted was a place to lay their heads. A new Governor, Robert Semple, was with them, a replacement for the captured Miles Macdonell. The whole group returned to Red River, rebuilt the houses and settled down for the winter, to the astonishment of the Nor’westers. A Canadian freeman, Jean Baptiste Lagimodière, set off overland to Montreal, to inform Lord Selkirk that, against all odds, the colony had been reestablished. Selkirk now decided that some kind of military force was needed to protect his settlers at Red River. He hired a number of demobilized soldiers, and set off in the spring of 1816, to reach his colony by way of the Great Lakes canoe route. At Sault Ste Marie, terrible news reached him from Red River. On 19 June 1816, a brigade carrying pemmican for the North West Company, under the command of a young Métis clerk, Cuthbert Grant, was passing overland behind the settlement. Robert Semple, accompanied by some colonists and Hudson’s Bay servants, had gone out to confront them at a place called Seven Oaks. Everyone on both sides had a gun, and once the first shot was fired, the superior marksmanship of Grant’s horsemen had its inevitable effect. Within a few minutes, Semple and 20 of his companions lay dead or dying. In later life, Cuthbert Grant admitted that he would have gone on to overrun the rest of the colony, and kill more people. But the Ojibwe leader Chief Peguis, who had already shown himself a friend to the colonists, stepped in, prevented further bloodshed and saw to it that the bodies were buried in a common grave. It was the news of this bloody episode that reached Lord Selkirk on his way up from Montreal. Selkirk pressed on to Fort William, the North West Company’s great depot, captured it, arrested several of the partners, and found in their documents much evidence that the Company had planned the destruction of his colony. He wintered at the Fort, and in the spring continued on to Red River. There, he met the settlers, assuring them that they were safe now. Some of his mercenaries were settled on farm lots. Selkirk was a handsome man of sincerity and charm, and the few weeks he spent at Red River were remembered by the settlers for the rest of their lives. He then returned to Canada, where he became embroiled in legal struggles with the North West Company. By the time he got back to Britain, he was in the grip of tuberculosis, and he died in the south of France in 1820, and is buried there. Much of his fortune was gone, but he died knowing that the Red River Settlement would be a success. The settlers still had much to contend with—cold winters, unsuccessful crops, grasshoppers, and in 1826, a catastrophic flood. A sudden, late breakup of the Red River brought huge chunks of ice down upon the settlement’s houses, sweeping everything away. But the houses were quickly rebuilt, and life went on. The settlers knew where they were now, what the country would demand and what it could give, and what they had to do to make their community a success. With each year, more and more children were born for whom the environment was not strange, but simply the world they knew. No more new settlers came direct from Scotland after 1815, but the colony was a centre to which fur traders could retire, and occasional settlers could come from Canada. The Hudson’s Bay Company provided basic government services, including a system of land titles, a court system, and some resources for religion and education. The founding of the Selkirk Settlement in 1812, whose bicentenary we mark this year, was an important step in the development of western Canada. By planting here a colony of British subjects, Lord Selkirk made it unlikely that the expansionist United States would simply continue north and west, and annex all of Rupert’s Land. The boy of seven, who had been frightened by John Paul Jones, showed as a man a vision that was well beyond the average British colonial administrator. As for the settlers, they proved that a farm economy, which can support a large population, was possible in what is now the Canadian West. This knowledge encouraged Canada to purchase Rupert’s Land, make the west a part of our country in 1870, and open the land to settlement by millions of European immigrants in the generations to come. 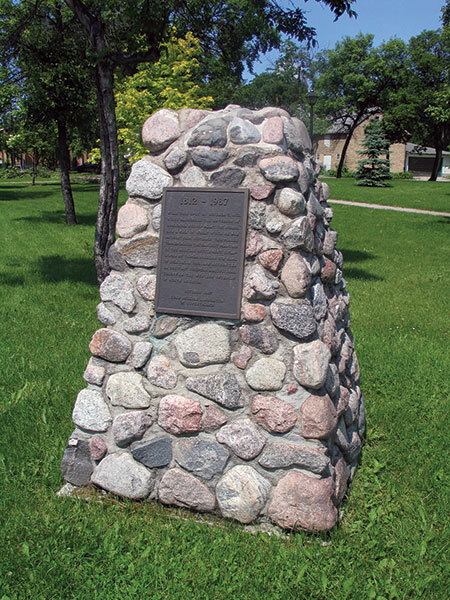 A small cairn in Joseph Zuken Heritage Park near the MHS’s Ross House Museum commemorates the spot where, on 7 October 1812, Miles Macdonell helped to plant the bushel and a half of wheat brought from Scotland on behalf of Lord Selkirk. It was the beginning of the “prairie breadbasket” in western Canada that would eventually become an important component of the global food supply. The cairn was dedicated in October 1987 by members of the Lord Selkirk Association of Rupertsland.